Melissa and Doug Fire Chief Role Play Costume Set allows your child to dress up like heroic hometown firefighters! 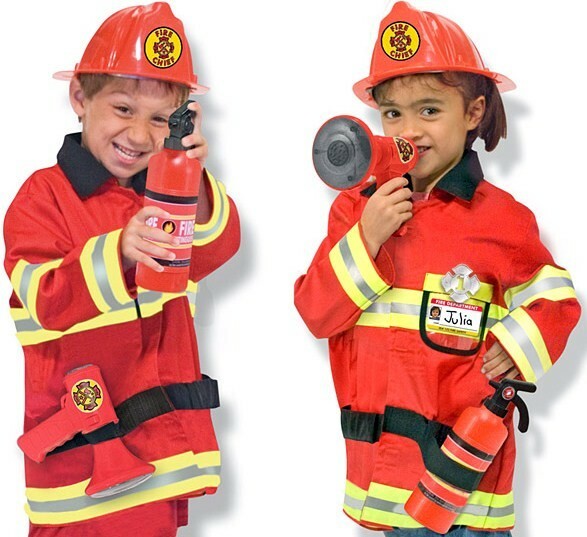 Here is everything your firefighter needs in an emergency -- a bright red, machine-washable jacket high-lighted with reflective material, a Fire Chief helmet, a "fire extinguisher", a bullhorn with sound effects, a shiny badge and a name tag for personalizing. Made for kids ages 3 and up with top-quality construction. For more empowering dress-up clothes, visit A Mighty Girl's Costume section.